Full Service Yarn Shop: Happy Birthday Grandma! In addition to being Mother’s Day, it is also my grandmother’s one hundred and third birthday. The woman is older than powered flight. The Wright brother’s first flight happened after she was born. It is amazing to me to think that the phone and radio were new fangled inventions to her at one time. Now I’m writing about her on a blog, a form of communication that I’d never even heard of five years ago. My grandmother was a thoroughly modern woman in her time. 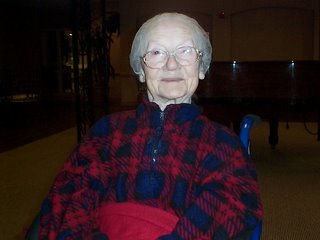 She went to college and had her own job, apartment and car all in the 1930’s! She didn’t marry until after she was thirty and didn’t have her first child (my mother) until she was 33. She taught art in the Boston Public Schools and has been an artist her whole life. 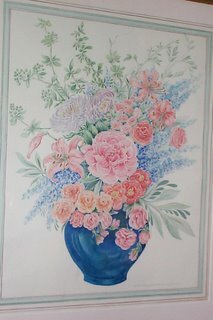 I am fortunate to have a number of her watercolors. One of my favorite quotes from her comes from the whole Clinton/Monica Lewinsky affair. We were talking about it and she said to me “Someone should tell that man that it’s the White House, not a playpen!” Not much got past grandma. She’s a lot frailer and more confused now but she still knows who we all are and has the energy to give the nursing home staff a hard time when she feels it necessary. So that’s my grandma, 103 and still a force to be reckoned with. Stay tuned for my Mother's Day post about my mom! holy crap grandma... willard scott is gonna have to throw a special tv miniseries just about her. congrats!